Pune: The managements of 112 schools in the city have refused to participate in the ongoing online admission process under Right to Education Act (RTE) because they haven’t received their dues from the government since last three years. The office of deputy director of education, Pune, has sent notices to schools, warning them of de-recognition if they had not registered by March 31. Till now, 349 schools have registered for online admissions. “Of the 176 schools in Pune, 26 have not registered. Haveli area has 125 schools, of which 37 have not registered. In Pimpri-Chinchwad, 49 of the 160 schools have refused to register,” stated a press release issued by the education department. Only private unaided schools come under the provision of RTE, which requires schools to reserve 25% seats in entry level classes to be reserved for students from economically and socially disadvantaged categories of the society. The schools that have refused to register say the government has not paid them any money since the law was enacted in 2012-13. “Three academic years have passed and despite filling up all the necessary forms, we have not got any reimbursement. In 2012-13, the compensation amount was fixed at Rs 14,000 per child per year, it was cut down to Rs 13,474 from 2013-14 onwards. How is this compensation justified?” asked a private school management member. 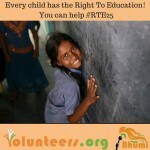 l.t, the government has to give reimbursement for every kid who is enrolled in the 25% reserved category. The compensation is fixed as either the annual average cost set by the government after calculating what it spends on a student in government school or as the annual school fee of the respective private school, whichever is less. But private school owners complain that even these guidelines are not being followed. “The education minister had said in Sangli said that government spends Rs 96,000 per student per year in a government school. But for schools, only Rs 13,474 is earmarked per child,” said Rajendra Singh, president of Independent English Schools Association . Aurangabad: With the schools allegedly not cooperating with the education department of the Zilla Parishad (ZP), the RTE admission process in Aurangabad district has gone for a toss for the second time. The education department has now extended the admission deadline till April 13 after several schools failed to carry out online registrations even as the stipulated deadline ended on Sunday. Earlier, April 6 was the last date for schools’ registration, but the deadline was pushed to April 10 due to the alleged non-cooperation from educational institutions. R S Mogal, education officer (primary) in the Aurangabad ZP, told TOI on Monday that schools that do no register before the extended deadline would have to face dire consequences. “We will not release the dues towards RTE reimbursement for last year’s admissions to schools that do not register before April 13. Besides, legitimate action against such errant schools would also be initiated as per the enabling provisions of the RTE Act, though the process is a bit long,” he said. Mogal said the next phase of RTE admissions could not be started unless all the eligible schools get registered. “The RTE admission process has been taking place in an online manner through the state-level portal. We cannot revert to any segment while carrying out the process. The school registration deadline has been extended in order to ensure that the beneficiaries do not leave out any vacancies under RTE in their neighbourhood,” he said. The RTE admission process has been already running well behind the schedule. Almost three weeks were lost earlier as the dedicated portal (www.rte25admission.maharashtra.gov.in) for carrying out online admissions developed technical snags. Ajmal Khan, national vice-president of Akhil Bharatiya Samajwadi Adhyapak Sabha, said stern action must be taken against schools trying to evade the RTE Act. “Some deterrent has to be set by taking stern action schools trying to evade the Act. The education department should immediately issue show-cause notices to these schools and invoke punishment upon receiving unsatisfactory reply,” he said. City-based schools that have already registered for RTE admissions lamented another collapse of the official schedule. “The delay means working days for schools during summer vacations. Our staffers and management will have to suffer for no fault of theirs,” said a school head on the condition of anonymity. The admission process for 25% quota reserved under the Right to Education Act, 2009, in schools became online for Auangabad from the last academic year. While only urban areas were considered for the online process last year, rural areas too have been covered under the same this year. Kolhapur: As many as 223 private primary schools in the district have registered to provide admissions under the Right to Education, said district primary education officer Subhash Chougule on Thursday. There are 323 private schools in the district which are eligible for admissions under the RTE Act. “If we had gone ahead with the original schedule, the first phase of RTE admissions could have been finished by now. Due to the technical issues, schools which have not yet registered have been told to enter their details at the earliest. The registration of schools was supposed to end on March 9 and parents had been told to fill applications by March 28,” he said, also mentioning that officials have not yet been told when parents can fill the forms. “The registration of is likely to be over by this weekend,” he said. An official from the same department said there are over 3,000 eligible seats reserved under the RTE for admissions in the district. He said that once the parents submit their applications, the system will choose the closest school depending on the address entered. Admission can only be secured through lottery process for parents have to apply online. Help centres will be set up across the talukas the online application. tnnSattappa Mohite, an education activist, said that the sloppiness in the RTE admission is not new and the administration needs to improve their infrastructure to avoid these things from repeating. Last year, with more than 40% RTE seats remaining vacant in the district, the Kolhapur zilla parishad asked schools to survey areas in a 1km radius of their premises to identify RTE beneficiaries. The admission process had to be extended till September after the poor response in the district. With this current process delayed as well, activists say this year will be no exception either. Under the RTE act, economically and socially disadvantaged children, as well as those with disabilities, can be admitted in Class I or at the pre-primary stage, of private unaided and minority aided schools. These children will receive free education including textbooks, and other facilities. Pune: Over 400 schools in Pune and Pimpri Chinchwad have registered online to providing admissions under 25% quota of Right to Education (RTE) Act the academic session 2016-17. Last year, only 240 schools had registered. The deputy director of education (Pune) will announce the schedule student enrolment this week. 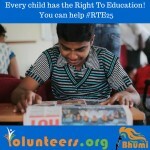 Last year, about 13,782 seats were up grabs students from economically weaker sections under the RTE. With more number of schools registering this year, the parents will have more seats to choose from. The Schools can register online till March 31. In the first week of March, the managements of private English medium schools were told to register online, giving details of available seats and location of school. However, the government website remained dysfunctional throughout last week of admission. Except schools from Nashik, from other districts of the state no other school could complete the task. The process has gathered momentum over the last few days. MUMBAI: After over a 20 day delay, the online applications for admissions for the 25% seats reserved under the Right to Education Act, 2009 will start today (Thursday). The online applications will be open up to April 15. The RTE admissions allow students from economically backward sections to seek free education in non-minority, unaided schools. The application for the RTE seats had been delayed after school registration, the phase one of the admission process was delayed due to technical glitches. The Brihanmumbai Municipal Corporation (BMC) which conducts the admission process has received registrations from a total of 316 schools, four more as compared to last year. Of these, 272 schools are affiliated to the Maharashtra State Board of Secondary and Higher Secondary Education. Parents can sign up at rte25admission.maharashtra.gov.in and fill application forms. The BMC has also set up 36 help centres to assist parents in the process. As per the Right to Education Act, the government has to give reimbursement for every kid who is enrolled in the 25% reserved category. The compensation is fixed as either the annual average cost set by the government after calculating what it spends on a student in government school or as the annual school fee of the respective private school, whichever is less. But private school owners complain that even these guidelines are not being followed. NAGPUR: More and more schools are now standing up to the state government and questioning why they should give free admissions under Right To Education (RTE) quota if all pending bills are not paid. Independent English Schools Association (IESA) has decided to approach the court after its Working Committee meet in Pune ratified the proposal. Rajendra Dayma, co-founder and vice president of IESA said, “We will approach the court to seek an answer on why we have not been reimbursed fully for admissions given till date.” Under RTE Act, schools are obligated to reserve 25% seats and give free admission to students sent by the local education office. The state government on its part pays schools the fee according to the amount it spends on its students annually. In Maharashtra, this amount has been calculated around Rs 13,500 per year. The dispute is a result of Maharashtra’s failure to pay up the entire amount. So far schools here have received payment for admissions done from 2012-13 and 2013-14. But even for these two years only 66% of the bills have been cleared. Schools have not been informed why the balance amount has been held back and when it will be paid to them. Apart from this, schools have not received even a single penny for 2014-15 and 2015-16. While the latter can be excused as that academic session has just ended, there’s still no clarity on why the government is holding up payments for the previous years. TOI had reported earlier on how the Maharashtra English Schools Trustees Association (MESTA) too has decided to boycott RTE admission process. MESTA has given a memorandum to Nagpur education officer, Dipendra Lokhande, that until all pending bills are cleared no admissions will be given under RTE. KOLHAPUR: Over 200 private schools from the district have registered online for the Right to Education (RTE) Act admission process this year. The application process for parents, who want to enroll their children under the Act, started from Friday and will end on March 30. This year, the education department is carrying out the admissions in three steps. This is because of the numerous problems the department had earlier faced for both online and offline admissions. The department has come up with a proper stage-wise planning to ensure proper compliance this time round. An education department official on the admission status said that they are yet to get the final number of schools which have registered from the district. However, considering every year’s experience there are more than 200 private schools in the district, offering RTE admissions for the reserved quota. Schools were asked to fill in details about their class strength and their entry point. The schools’ entry point can either be at the class I or pre-primary stage. This was left up to the schools to decide, the official said. The official said that the second phase, which started from March 11, where the parents have to fill up admission forms. The system will choose the nearest school according to the address entered by parents as well as location tracking, using Google Maps. The official said that filling the admission form is a formality to be able to participate in the lottery. The lottery is the only way through which admissions can be secured. The third phase will be of the admission itself and will be held between April 1 and April 5. According to the official, workshops for the concerned authorities have been conducted over the past months. Last year, more than 40% RTE seats were vacant position across the district. The Kolhapur zilla parishad had then asked the district schools to take a survey in a one-km radius of their school premises to identify any RTE beneficiaries. However, the admission process had to be extended to September, after the poor response in the district. Under the RTE Act, economically and socially disadvantaged children, as well as those with disabilities, can be admitted in Class I or at the pre-primary stage, of private unaided and minority aided schools. These children will receive free education including textbooks, among other facilities. 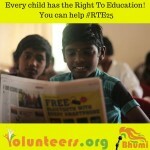 A recent report on the condition of the RTE Act revealed that different states across the country had vague norms about the implementation of Section 12(1)(c) of the Act. The section mandates 25% reservation for children from economically and socially disadvantaged strata in private and unaided non-minority schools. The report was jointly published by the Indian Institute of Management-Ahmedabad and other agencies. The report stated that a reason for low school participation is the delay in reimbursement to schools for admitting students under the Act.Some of the suggestions that experts provided so as to tackle the issue was to ensure reliable and timely disbursement of funds by streamlining processes, transferring funds on time to districts, reviewing manpower needs, and coordinating with bank officials to ensure that schools are reimbursed on time. 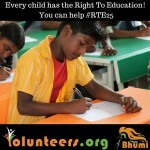 A report by the Indian Institute of Management-Ahmedabad and other agencies found that states had unclear rules and guidelines to implement Section 12(1)(c) of the Right to Education (RTE) Act, which mandates 25% reservation for children from economically and socially disadvantaged sections in private unaided non-minority schools. Ashish Dhawan, founder and chairman, Central Square Foundation, a philanthropy, said, “Awareness is still patchy, especially in rural areas. Once children enter the school system, the provision of supporting and child-tracking is almost non – existent. One reason for low school participation is the delay in reimbursement to schools for admitting students under this provision, the report stated. Ensuring reliable and timely reimbursements by streamlining the processes, transferring funds on time to districts, reviewing manpower needs, and coordinating with bank officials to ensure that schools are reimbursed on time, are some other suggestions from experts. Nagpur: The tussle over Right To Education (RTE) quota admission and its reimbursements looks to be heading for a faceoff. On Thursday, a small group of private schools from Nagpur city approached the education department and questioned why they should continue to give RTE admissions when the government has paid only 66% of their bills. Schools are also learnt to be mulling the option of stopping RTE admissions for 2016-17, at least for sometime, to send a strong message to the government. Despite the fiasco over the 25 per cent quota admissions for students from the economically weaker sections under Right to Education (RTE) Act last year, the education department seems to have learnt no lessons. After delaying the 2016-17 admission process for weeks by claiming to come up with a new software, the primary education department finally announced that the statewide schedule for RTE admissions starting with school registrations would begin from February 27 in Pune. While a few schools have been informed about the delay in the process informally, the department, which issued an official communication about the last schedule, is yet to announce a new schedule officially, leaving both schools and even parents in confusion. In the online RTE admission process, first school registration has to be completed wherein schools have to fill data about their entry point and total intake based on which education department gets an area-wise data on number of RTE quota seats available. This will be followed by online registration by parents of their children and lastly lots will be drawn for allotting seats. In this case, the first process itself has not yet started. “The entire issue that arose last year was due to a lack of timetable and planning. It’s a good move that they are coming out with a new software. But if the dates are being extended or delayed, shouldn’t they inform all stakeholders through a public announcement? According to the last announcement, parents were to begin registration from March 8. Yesterday, one parent came to my school and said he wanted to register and I explained to him he had to do it online. But from Monday, if they aren’t able to do that, again chaos will begin,” said Nandkumar Kakirde, director and honorary secretary of Bal Shikshan Bhavan. Anvit Sudheer Pathak, director of Milennium School, also confirmed he wasn’t able to register but said he had been informally communicated that registrations would be delayed. “But they should come out with a circular to avoid the confusion which other schools might naturally be facing,” Pathak said. Meanwhile, Dinkar Temkar, deputy director of education (primary), admitted to the delay in the process which he blamed on technical glitches in the new software. “We had earlier expected to finish the process of school registration by March 5, but it could not be done. So I think there would be some minor delays in the process. Currently, we have resolved the issue and started school registration only in Nashik district. If it is successfully done there, rest of the districts would follow suit from next week,” he said. However, when asked if a fixed date had been decided for the process to begin in Pune, Temkar said the picture would be clearer by Saturday evening about the Nashik situation after which further dates would be declared.